Last month Shake Shack Chicago opened up in River North and being the foodie that I am, I obviously had to try it. I rallied up some of my foodie friends and after work one Tuesday we headed over. We had to wait in a line (about 20-30 minutes to get your food). 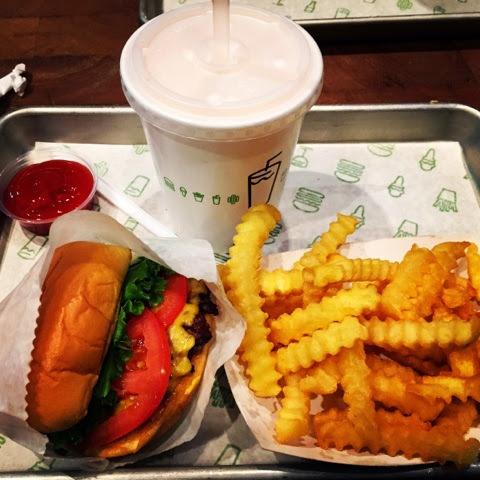 I ended up ordering the single shack burger, regular fries, and a strawberry shake (cuz duh Shake Shack). After scouring and using some hovering tactics over the very crowded restaurant, 1 of the 3 of us was able to snag a table where we could enjoy our food. Everything was as delightful as I had hoped. The burger was juicy and fresh and the fries were just the right amount of crispy. And you really can't beat a good strawberry shake. My only complaint was that they posted the calories on the menu. If I plan to indulge, I don't want to see the number.